Accutech Engineers (Accutech Engineers Pvt. 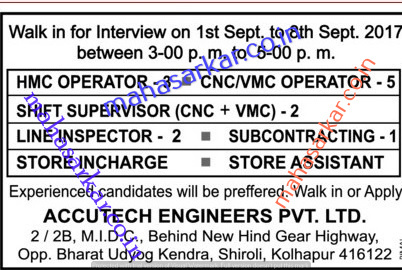 Ltd.), Kolhapur Published Job Notification for 15 HMC Operator – Line Inspector & More Posts. Candidates who wish to apply must look at Accutech Engineers Recruitment 2017. Eligible candidates can join Walk-in Interview on 1st September 2017 to 8th September 2017. Education Qualification: Graduation/Post Graduation/12th Pass Turner and More. For Post wise Education Details follow the detailed advertisement. Interested & Eligible candidates may attend for walk in interview along with all the documents addressed at Accutech Engineers Private Limited, No. G-13, M.I.D.C, Shiroli,Kolhapur-416122, Maharashtra, India.. Starting Date, Last Date to Apply Offline at Accutech Engineers Pvt. Ltd. which candidates should be remember as follows. Walk-in Interview on: 1st September 2017 to 8th September 2017. Kolhapur GK Current Affairs 2019 Kolhapur History | Kolhapur Geography | Kolhapur Science | Kolhapur Polity | Kolhapur Economy | Kolhapur Law etc.